The right tote, luggage tag and other accessories can alleviate some of the stress and hassle that sometimes goes with traveling. Providing promotional marketing items for travel is a great way to give your customers items they can use, while also positioning your branding message in front of a much wider audience. 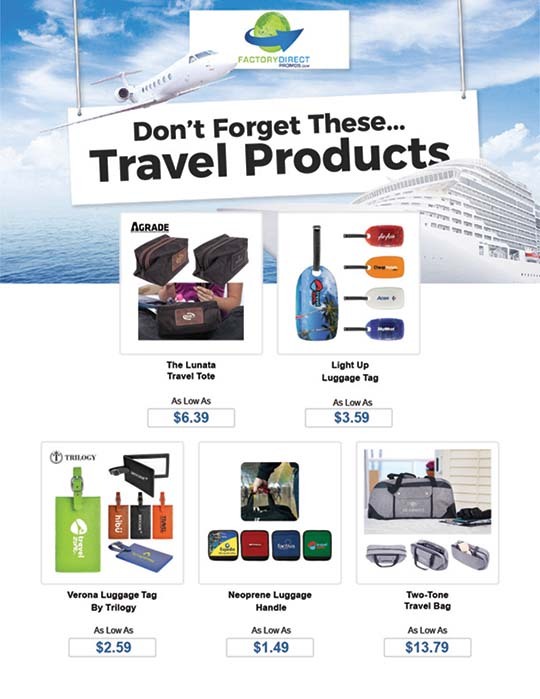 Check out these promotional marketing travel products and for a limited time, you can land a great deal and find out just how far you can stretch your marketing budget. This tote can hold toiletries, cosmetics and other small items, but is still compact enough to fit inside luggage. The large zippered opening makes it easy to pack everything up or retrieve what you need. Durable nylon stands up to regular use, while the faux leather trim and contrast stitching give this tote a sophisticated appearance. The liner interior provides additional durability and helps contain spills or leaks. Customize this travel tote with your brand’s name, so it will remind your customers about your company every time they reach for it. Luggage tags make it easy for your customers to confirm their bag on the luggage carousel, but these light up luggage tags make it easy to identify a bag from a distance. A built-in motion sensor causes the lights to flash when movement is detected, so as the bag enters the luggage carousel it is easy to spot. This tag attaches to luggage via a buckle strap. An included card provides space for a name and contact info. The reverse side of this tag can be customized with your company’s name, logo and other info to help raise awareness of your brand. Take a classic approach to labeling luggage with the Verona luggage tags by Trilogy. The leatherette material is soft to the touch and durable. A protective flap conceals the owner’s contact info to help identify the luggage. The tag easily attaches to luggage using the adjustable strap and buckle. The cover of this tag can be customized with your brand’s info to spread your info to everyone who sees it. Built-in luggage handles can sometimes be uncomfortable to carry, but not with the neoprene luggage handle. This soft square of fabric can be wrapped around uncomfortable tote and suitcase handles to prevent straps from digging into your customer’s hands. This handle can also be wrapped around the handles of several bags, making it easy to carry multiple bags at once. When left on checked bags, this handles makes them stand out and easy to identify. Print your logo and other branding information on this handle and transform it into a promotional marketing tool, it will help to promote your brand every time your customers pick up and set down their bag. This tote features multiple compartments, which make it easy for travelers to organize their gear. An exterior pocket with snap closure is a great spot to stash a boarding pass or other items a traveler may want to keep close at hand. Comfortable handles allow this bag to be carried by hand or worn over a shoulder. The distinctive two-tone design lends this bag a timeless appearance, but it also stands out a bit, making it easier to find this bag on a luggage carousel. This travel bag can be customized with your company info, making it a promotional marketing tool that will put your branding info front and center while your customers travel. All of these travel items are useful and however your customers travel, these items will help out. Your customers will likely appreciate your thoughtfulness in picking out functional promotional marketing items and this will cause them to create a positive association with your brand. Branded promotional products are a regular reminder of your brand to your customers, but they also expand the marketing reach of your company to everyone who sees your branded items while your customers travel. Find out just how easy it is to promote your brand with custom travel gear and for a limited time you can score these items at a great price. From July 31 through August 15, 2018, all of these new and exciting travel products are on sale. Get your quote now for these promotional marketing items NOW! Next Next post: Is YOUR Business Impacted By These Plastic Bag Bans In The United States?